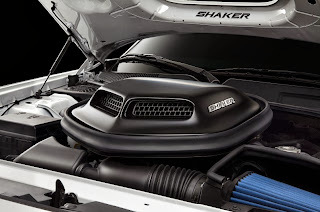 Car fans will want to start watching for the “shaker” hood again next summer, this time on the limited-edition Mopar ’14 Challenger – the latest special-edition car from the parts, accessories and customer care experts at Mopar. But it may be rare that you spot the Mopar ’14 — only 100 copies will be built. Ordering begins next March 2014 and deliveries will start that summer. 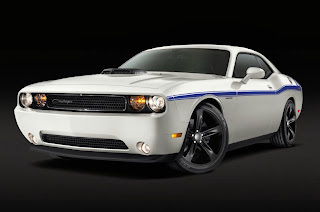 The Mopar ’14 marks the first time a Mopar special edition will be offered in white. Or, keeping with the tradition established by the Challenger R/T, Charger R/T, 300 and Dart, the Mopar ’14 can be ordered in black. Either color is accented with Mopar Blue stripes. Standard is a “shaker” stripe that runs down the center of the hood, roof and trunk lid. 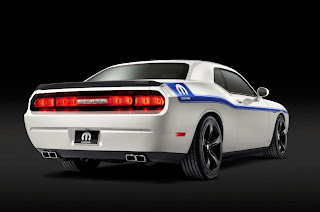 Buyers can also choose a heritage A-line stripe that wraps up and over the trunk lid and includes the Mopar logo in the rear quarters, or a rocker panel triple stripe that includes Mopar on the doors. Completing the look are 20-inch aluminum wheels, painted gloss black. Given Mopar’s vast lineup of accessories, it’s quite possible that each Mopar ’14 built will be a one-of-a-kind car.